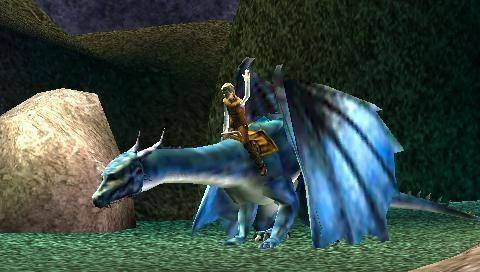 The upcoming blockbuster movie Eragon has landed on the PSP that is extremely reminiscent of Drakangaard that mixes elements from a variety of different genres into one entertaining adventure game. Whether riding a power fire-breathing dragon or battling your way through the minions of darkness, Eragon promises the gamer an enriching journey into a wondrous universe of sword and sorcery. The story revolves around Eragon who stumbled upon an ancient egg that hatches to become the powerful dragon Saphira. Eventually Eragon and Saphira become the closest of friends and when war threatens to ravage the lands, it is up to our two heroes to liberate the freedom of their world from the servants of darkness. In its essence, Eragon is an action game and while you're Saphira, you can perform a variety of flight maneuvers and combat maneuvers. Apart from Saphira innate ability to breath fire, the dragon also has access to a variety of spells that include ice storm and lighting to devastate your opponents. One of Saphira's most interesting spells is the disease that summons insects to chase your foes and while feasting on their live bodies, it drains the energy from them, eventually slaying them. However, when Eragon is not riding his power dragon through the skies, our hero also has access to his trusty long bow that contains a variety of magical arrows to challenge even the most deadliest of enemies. Fortunately, the title features a very in-depth tutorial that teaches the gamer the controls of the game and also the abilities of both characters. After 30 minutes of playing, even the most novice of gamers will have no problem in controlling their avatars through this amazing universe. With that said, the control system on the PSP is perfect and it uses a combination of just about all the buttons and the analog stick to interact with the gaming environment. Gruesome and nutritious! Graphically, Eragon does look a little sparse on the PlayStation Portable but considering the amount of freedom the developers have implements, one can forgiven this aspect of the game. The characters have been professionally designed that feature realistic texture details and human-like movements that flawless interact with the gaming environment. There are also a variety of impressive special effects in the game from the deadly arrows of Eragon to the magical spells of Saphira. 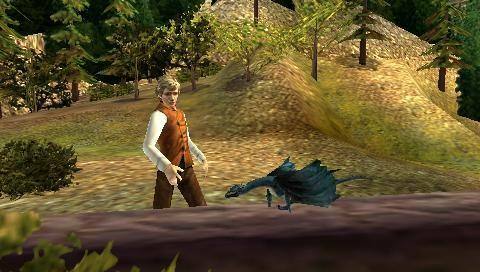 Musically, Eragon is a masterpiece of the PSP with the musical score being taken directly from the blockbuster movie. The voice acting of the title, although not outstanding is component and immerses the gamer into the world of Eragon. Apart from that, the game features all your stock standard sounds of battles, dragons and shouts of enemies. In conclusion, Eragon is an entertaining game that will sure to win the hearts of gamers around the world, especially those that love an in-depth sword and sorcery title. Match that with impressive gameplay and a sturdy gaming engine and there is little to complain about this much needed title for the PSP. Great stuff!